SQUAMISH, BC – Howe Sound Brewing has just released their newest seasonal beer, Three Beavers Imperial Red Ale. 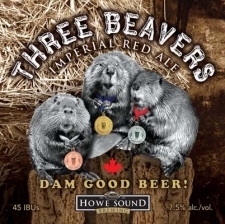 The beer features a label and advertising that pictures three beavers wearing gold, silver and bronze medals, suggesting a connection to the upcoming Winter Olympics. However, brewery co-owner Leslie Fenn told the Vancouver Sun that in order to not violate the rules regarding marketing related to the Olympics, the image is intended to represent the gold, silver and bronze medals that Howe Sound won at the North American Brewers Association awards in 2007 and 2009.